A famous shloka states that the feet of Bhagavan Sri Ram had numerous symbols. These symbols help a person in self-realization. Ankush – This symbol helps man to tame the mind which is like a rampaging elephant. Sky – This symbol indicates that His feet are all pervading. It also shows that even though His feet are everywhere, they are unattached just like the sky. Conch – This symbol suggests that those take refuge at the feet of Bhagavan Sri Ram are always rescued. Flag – This symbol suggests that Bhagavan provides protection from all external evil forces. Fish – This symbol indicates just like water is necessary for fish to survive, the divine blessing of Bhagavan is necessary for human beings to survive in the rough waters of the world. Lotus – This symbol suggests that one needs to stay afloat on the dark waters of the world without being maligned by them. For this, we need to take refuge in the lotus feet of Bhagavan Sri Ram. Bow – Single pointed focus of life should be moksha or liberation. Altar – Sins of previous birth will be purified by burning them off and this can happen only when one takes refuge at the feet of Bhagavan. Half-moon – this symbol indicates that desires of devotees will be fulfilled when they are true devotees of Bhagavan Sri Ram. Pitcher – There will be always auspiciousness. Chakra (disk) – Only Bhagavan can rescue us from worldly maya. Umbrella – Shelter for those who repent. Cow – hoof – nourishment. There will be abundance of food and water. Thunderbolt – It smashes ignorance. Rose Apple (Jambhu) – On the entire Jambhu Dvipa, there is no other safe place than the lotus feet of Bhagavan. Club – Used to put down lust and passion. Spear – To cut all entanglements and difficulties. The spear will carry away all forms of difficulties in life and deposit it faraway. Flower – Fragrance of devotion will attract even the greatest sinner to the feet of Bhagavan. 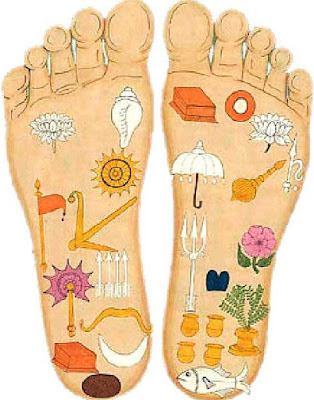 Creeper – For those who wish to achieve moksha or liberation, the feet is like a stem used by a creeper to grow. Plough – It explains the importance of hard work and the importance of helping each other. Work hard without thinking about results. Offer all work on the lotus feet of Bhagavan, He knows what is right for you.